Good resumes highlight achievements that are most relevant when applying for a job. On the one hand, these are your achievements, so it could make sense to write “I grew…”, “I built…”, “I led…” and so on. On the other hand, there's a good reason why first-person resumes are frowned upon: as the saying goes, there's no “I” in “team”, and all those “I's” make you sound self-centered with a big ego. Write your resume in the 3rd person, and begin each achievement mention or bullet point with a different positive action verb. Using action words this way implies the achievements are yours without you appearing conceited. Here's a long this list of powerful action verb examples to get you started on your CV writing or resume update. Most overused action verb in resumes: "spearheaded." Sounds like everyone wants to go kill some fish. Finally, these powerful action words can also be used in your cover letters, LinkedIn profile, personal website or a bio appearing anywhere you promote your expertise. Share this list with anyone you know who’s updating their resume. Which do you think is the most overused positive action verb? Or which is your go-to? Tell us in the comments. Subscribe to JobMob via RSS or email and follow me on Twitter for the best resume success resources on the Web. I’d love to see a list like this translated into Hebrew…. This is a great list, but it would also be nice to have a list like this in Hebrew. Since these are mere words, you will get them right I guess. Of course it helps if you really do display the characteristics behind those action words. This is a great list and more thorough than many I’ve seen. Of course, as @senthilnambi pointed out, you must display the characteristics behind the words – but provided that you do, this can help your resume stand out further by getting away from standard, boring phrases like “responsible for” and “duties included”. Focus on results you achieved, not just re-hashing your job description. A great list of verbs. 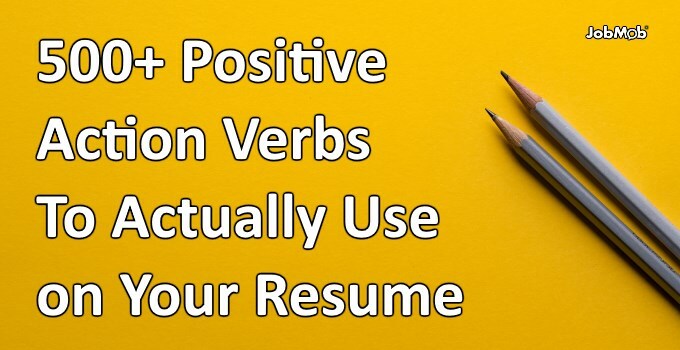 I agree that your resume you should use active verb instead of passive verb. There are so many tools for job seekers. You just have to pay attention and use the resources available. I am curious as to why ‘utilized’ is present. It always struck me as an odd, out-of-place-anywhere-it-was-used kind of word. I’m not one to be pedantic, but the word ‘resume’ is missing the accent over the ‘e’. Punctuation ain’t in the list. Well, I must now resume my previous activity. Wow, I should use these great verbs for my resume! coming from a U N background you left out one of our faves – ‘positioned’. well done list. barry- ‘positioned’ seems neither positive nor negative, but it does depend on the context. Can you give me an example where it’s used positively e.g. by people at the UN? This is a great list. It can be difficult sometimes to dig out of your brain just the right word for your resume or in other writing situations and a thesaurus does not always help. I got a few good positive verbs here. Thanks and good luck with your site! Like how it has “Inspected,” “Pursued,” “Ran,” “Tackled,” “Arrested,” and “Questioned,” but not Convicted. Great resume material. mcd- perhaps for e.g. law enforcement positions, “convicted” could be used as a positive resume verb. I’ve added it. If I ever teach English again, I’ll use this list to teach people how to write their resumes. I tweeted this so other English teachers can use the list too. BRILLIANT resource and so needed! Actually, “orchestrated” also means something in the IT industry. Truth be told, not all the verbs in the list are relevant for every industry. First-time job seekers are more likely to have a problem recognizing what’s proper, but regardless, any job seeker can google industry resumes + the action verb they’re considering to look for precedence.